Part overhauled cylinder head Work progressed on the ex-50008 power unit throughout 2009, with regular orders being placed with European Diesels for new components, and work progressing on the overhaul of existing items. Here one of the cylinder heads is seen in the process of being refurbished prior to refitting on the ex-50008 power unit. September 2009. Work progressed on the ex-50008 power unit throughout 2009, with regular orders being placed with European Diesels for new components, and work progressing on the overhaul of existing items. Here one of the cylinder heads is seen in the process of being refurbished prior to refitting on the ex-50008 power unit. September 2009. Spare Class 50 exhauster A shot of the upper housing on a spare Class 50 exhauster we have. 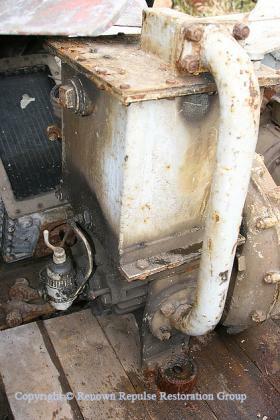 The ex-class 37 exhausters obtained from C.F. Booths are basically the same as a class 50's exhauster, but are not exactly the same. The main difference is the connections on the upper housing which are in different places, to suit the location in each class of locomotive, and the method of lubrication. Fortunately the actual upper housing itself is universal and as such can easily be modified to suit both classes, and the lubrication system can be changed if you have the components. September 2009. A shot of the upper housing on a spare Class 50 exhauster we have. 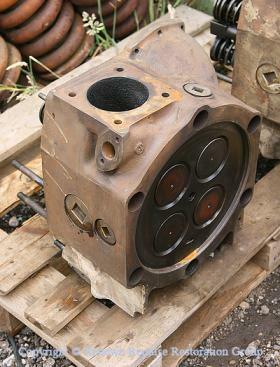 The ex-class 37 exhausters obtained from C.F. Booths are basically the same as a class 50's exhauster, but are not exactly the same. The main difference is the connections on the upper housing which are in different places, to suit the location in each class of locomotive, and the method of lubrication. Fortunately the actual upper housing itself is universal and as such can easily be modified to suit both classes, and the lubrication system can be changed if you have the components. September 2009. Class 50 exhauster lubrication system This picture shows a close-up of the small lubrication pump on the genuine ex-Class 50 spare exhauster we have. This exhauster has since been sent to Bowers for overhaul using ex-Class 37 examples (which are similar but not identical) as donor units. There are two exhausters in a Class 50 and both are still present in 50029 and 50030. Our policy for 50030 however is to restore and overhaul spare components where possible, which can then be exchanged with the components currently present on the locomotive. September 2009. 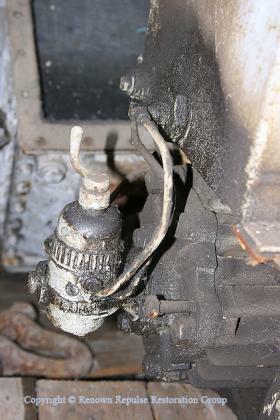 This picture shows a close-up of the small lubrication pump on the genuine ex-Class 50 spare exhauster we have. This exhauster has since been sent to Bowers for overhaul using ex-Class 37 examples (which are similar but not identical) as donor units. There are two exhausters in a Class 50 and both are still present in 50029 and 50030. Our policy for 50030 however is to restore and overhaul spare components where possible, which can then be exchanged with the components currently present on the locomotive. September 2009.